Preventive dentistry is a team effort. It works best when you and your dentist and your oral hygienist are working in unison and communicating effectively. Regular dental checkups provide the foundation for effective preventative dental care, but they work best when everyone is using the same playbook. When it’s done correctly, effective preventative care is the key to protecting the longevity of your teeth so they can last you a lifetime. Here’s some more good news. Visiting your dentist will also benefit your overall health. In fact, a recent study from researchers at UC Berkeley suggests that “women who get dental care reduce their risk of heart attacks, strokes, and other cardiovascular problems by at least one third.” Further studies have also linked poor dental hygiene to increased incidents of dementia, respiratory disease and complications during pregnancy. A comprehensive dental checkup includes at least two essential elements, a cleaning and a screening. First, your dental hygienist will fully clean and polish your teeth. An indispensable part of this treatment is the eradication of the plaque which sticks to your teeth. This rough, hard substance must be removed because it can lead to gum disease. If gum disease is allowed to flourish, it can jeopardize the health of your entire mouth and eventually cause you to lose some or all of your teeth. 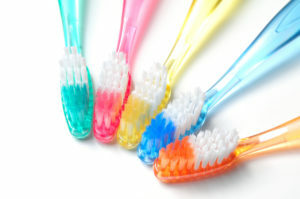 Fluoride is a “mineral that helps prevent caries and can repair teeth in the very early, microscopic stages of the disease.” Fluoride is an active ingredient in many toothpastes and mouthrinses and many communities already add it to their drinking water in order to provide extra protection from cavities, particularly for younger people. A fluoride treatment offers an additional level of treatment for preventing cavities that is administered by dental care professionals during a regular dental visit. The fluoride used for this purpose is much stronger concentration than the fluoride in toothpastes or mouthrinses and it generally comes in gel, foam, or varnish form. If your gums are red and bleeding or if they cause you pain while eating or brushing, you probably suffer from some form of gum disease. Bad breath can also be a signal that you have gum disease. This is why a periodontal evaluation is one of the most important services your dentist provides. A periodontal evaluation simply means that your dentist is looking for early signs of gum disease and working on ways to treat the condition. Gum disease, also known a gingivitis or periodontitis, is the largest treatable cause of tooth loss. Screening for oral cancer is one of the most important functions of your regular dental office check-up that you won’t get anywhere else. In fact, oral cancer screenings provided by your dentist along with regular dental checkups can actually save your life. your lips, cheek lining, gums, front part of your tongue, floor of the mouth beneath the tongue and the hard palate that makes up the roof of your mouth. The throat (pharynx) starts at the soft part of the roof of your mouth and continues back into your throat. It includes the back section of your tongue, as well as the base where the tongue attaches to the floor of your mouth. Early cancer detection is invaluable, as it may result in better treatment outcomes and may help keep you or someone you love from becoming one of the 9,750 people whose lives may be claimed this year by the disease. Men are more than twice as likely as women to get oral cancer and other factors such as smoking and drinking excessively can dramatically increase the likelihood that a person will develop oral cancer. So these are two lifestyle choices people can make to reduce the possibility that they will get oral cancer. However, your dentist is the best qualified person to detect early sings of oral cancer. This is another good reason why you should schedule your appointment to get a checkup with Dr. Grubb right away. Another great reason to see your dentist and your oral hygienist at least twice a year is because they will provide you with useful oral hygiene tips that will help prevent cavities and gums disease. When you and your dentist work together, it’s the best way to ensure that your healthy smile will last a lifetime. So now that you’ve learned so much about preventative dental care, isn’t it time to call Dr. Grubb’s office and make your appointment for a checkup right away?